One of my top goals this year is to finally make some of my own large, more elaborate Styrofoam tombstones. 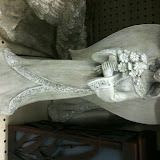 I've had it in my mind to incorporate some kind of angel at home in a cemetery into one, and I think I may have just found her at Big Lots among the spring garden statues. If you're thinking of picking up this tomb-making hobby in your spare time, here's a beginner's article on the art of the Styrofoam tombstone. My ultimate tombstone goal is to recreate a version of Terra's from the Halloween Forum "Beloved" Stone. Here's to hoping this new year brings the time to start some of these projects.